Every Christmas, photographer Peter Thorpe turns his dog into different animals. See the the dog HERE. PicPick is a toolbox full of utilities for graphics/design work. It combines eight tools into one neat package. A screen ruler, screen protractor, color picker, magnifier, and an excellent screen capture utility are the main tools in PicPick. It is for Windows only and is free for personal use. The best feature of PicPick is how well all of the tools are integrated. Installation is very quick and problem-free with only one .EXE needed. The program is pinned to the taskbar during installation, so that any of the eight tools are available by right-clicking the pinned icon. This makes it very convenient to launch any of the tools. 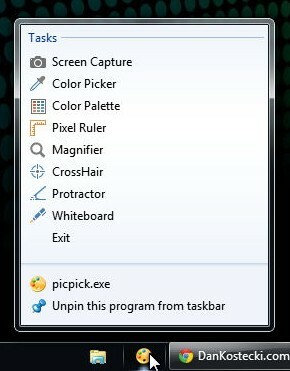 The portable version of PicPick will require manually pinning it to the Taskbar (not a big deal). The tools can also be launched through a desktop shortcut. I found all of the tools to be both simple and effective. The screen capture tool has top-notch features, such as image adjustments, drawing tools, and Save as PDF. I wish that the Color Picker and Color Palette tools had more options for adjusting/mixing colors, but overall, they are simple to use and effective. Rounding out the tool kit are a Cross Hair tool, to determine the pixel coordinates of any object on your screen and a White Board tool for making freehand notes on your screen. Certainly, if you do any graphics/design work, you regularly use one or two tools similar to these, but having eight great tools in one little package is too good to pass up. PicPick is free for personal use. Some filmmakers spend literally years trying to think of a movie title that will strike the right balance between “this doesn’t sound completely stupid” and “this will make me filthy rich.” It may not always look like it, but there’s a lot of effort, a lot of money, and a lot of hard drinking behind even the simplest of movie titles … all of which goes out the window once that movie ships overseas and needs to make sense in another language. See all 9 movies HERE. Thanks to a neural surgery and robotic technology, a man in Colorado named Les Baugh is the first person to gain the ability to control two shoulder-level robotic arms with his mind. The limbs and the technology that powers them were developed by Johns Hopkins University. Continue reading and watch video HERE. BuzzFeed gathered a few of the saddest Christmas trees found in Great Britain.